Are you hosting a baby shower in February? Do you want to sprinkle some Valentine spirit into the occasion? Try these baby shower favor ideas to celebrate the holiday and celebrate baby’s arrival at the same time. There are plenty of great ways to mix some Valentine spirit with your February baby shower favors. In fact, using baby shower favors that have some Valentine’s flair is an excellent way to add subtle hints of the holiday to the occasion without overdoing it. Just because you’re hosting a baby shower around Valentine’s Day doesn’t mean you have to go crazy with a Valentine’s theme. 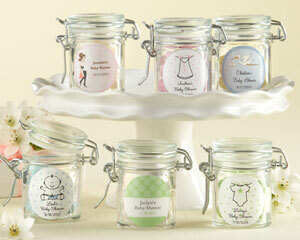 Instead, consider the following baby shower favors to add just a touch of Valentine Day spirit to the mix. 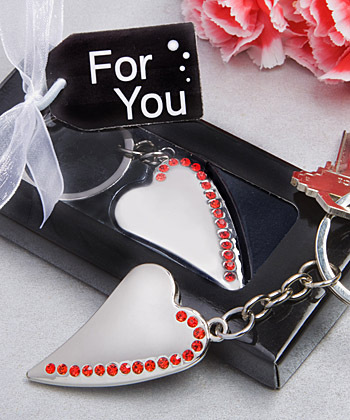 Contemporary Style Heart Design Metal Key Chain Favors—These key chains offer just a touch of Valentine spirit and they are the ideal baby favor because you can use them to stuff your other favors, such as favor boxes or bags. They feature a sleek, stylish heart design with subtle red rhinestones that trail along the side. 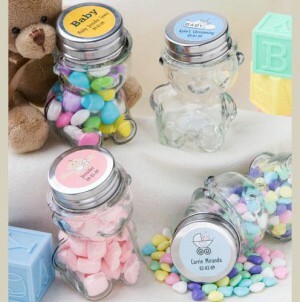 Personalized Jars with Red Hots or Sweethearts—Here’s a way to combine some Valentine spirit with a personal baby shower favor to create a memorable keepsake for your guests. Not only does it offer a nice keepsake, it also provides a nice splash of color to your place setting decor. Use personalized, see-through favor jars to display a customized message to your guests. You can use the baby’s due date or a baby-related message or theme to add some sentiment. Then, fill the jars with classic Red Hot candies or red, pink, and white Sweetheart candies. 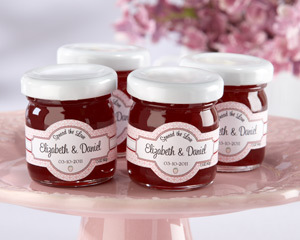 “Spread the Love” Personalized Jam—This is hands down one of the most unique, decorative baby favors to use to bring some Valentine spirit to your occasion, and you don’t have to worry about it overpowering any other baby-related theme you have going on. This favor won’t make your shower look like a Valentine’s Day aisle in a drug store. This small, luscious strawberry jam jar can be personalized with any message you’d like and is red, pink, and white—the perfect colors for baby shower favors for a February shower! This entry was posted in Affordable Baby Favors, Edible Baby Favors, Unique Baby Favors and tagged baby favor ideas, baby favors. Bookmark the permalink.